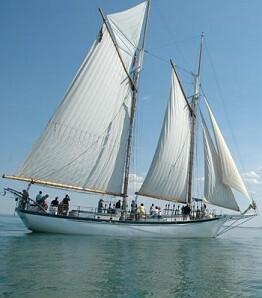 The Appledore schooners are owned and operated by BaySail, a private, non-profit organization. BaySail supports its Environmental Education and Youth Development programs through public sails, private charters, group tours, and port visits. 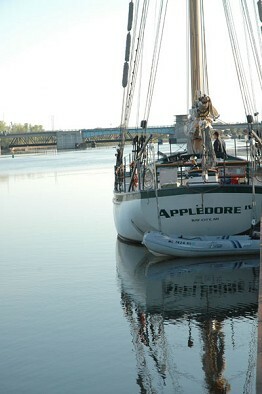 The schooner Appledore IV was launched in 1989. She is the fourth in a series of schooners built for world voyaging. The Smith's adventures aboard the Appledores are chronicled in two books "Dreams of Natural Places" and "Sailing Three Oceans". 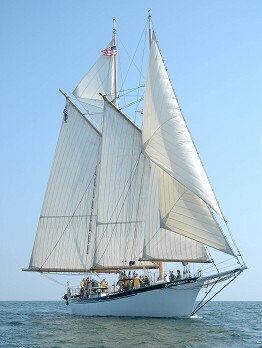 Herb and Doris sailed Appledore IV as far as Barbados and used her in the coastal day-charter trade out of Boothbay Harbor, Maine. Appledore IV is a steel hulled Gaff rigged schooner of a type typical of those sailed on coastal waters and in the Great Lakes right up to the end of the age of sail. Schooners were the workhorses of their era providing the primary means of transportation for goods and passengers over long distances. Appledore IV is a "working" vessel with pleasant accommodations down below and up on deck.